1. I appreciate all the love and “impressed” vibes that came my way after my “bagels and Fur Elise” post. Lest you be too impressed though, you should know that I’ve only managed to make bagels three times since Mark was born and only when Nik has been home. I used to make them regularly but somehow, I haven’t managed to get back into that baking rhythm, post-Mark. So, with another adult around, of course I can accomplish a lot! 2. This morning, I was listening to WYPR. It’s the winter pledge drive and Nathan Sterner was using the idea of a Venn Diagram to make a point. He started to explain a Venn and then said something like, “Oh but WYPR listeners know what a Venn Diagram is so I don’t need to explain it.” Then he proceeded to talk about how there is a circle of WYPR listeners and within that circle there’s an inner circle of WYPR members (i.e. supporters) and that they want to make the inner circle larger. That, my friends, is totally not a Venn Diagram. A Venn does not have an inner and outer circle. It has two (or more) overlapping circles. And you don’t use it to describe one group within a larger group but rather to describe where two different groups overlap and what those similarities and differences are. Probably every English/reading teacher on earth has used it to help kids learn how to do compare/contrast. This was annoying enough to me as a teacher that I felt like I had to call in to correct him. But then I felt guilty for calling in and complaining to a volunteer without making a pledge. So I made a small one and then told the volunteer that Mr. Sterner was wrong and that he might want to correct his illustration before using it again because if WYPR listeners do know what a Venn is, he’s going to look pretty silly saying the wrong thing. And I guess if his incorrect use of a Venn was designed to get annoyed teachers to pledge, well, it worked. Plus I love WYPR and listen every day as much as I can (when the kids aren’t close by) so I suppose it’s about time we donated something! 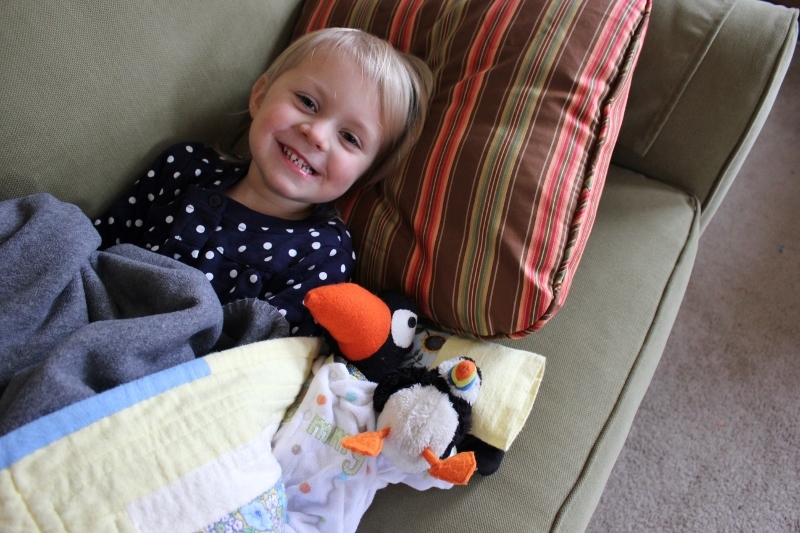 even puffins deserve naptime pajamas! 4. Mark has been sick off and on for the past three months. He has been remarkably good-natured during the day but our nights have been really difficult. I’ve spent way too many hours in our recliner in the office, trying to help him stay asleep (and keeping him from waking up Ellie). Often, he just tosses and turns and cries and won’t nurse to calm down. Last night, I discovered that if I rubbed his bare back under his pajama shirt, he sort of calmed down again. I had to actually be significantly massaging him (as opposed to just light stroking) but it really worked. And although today was really rough (because, apparently, if I went more than one step away from him, it was more than he could handle), I’m hopeful that this little skin-to-skin might mean more sleep in bed for both of us. I guess skin-to-skin isn’t just for freshly-birthed newborns!